This course offers an audio feature; speakers or a head set are encouraged. Professional caregivers must follow policies and procedures such as arriving on-time to their caregiving work assignment, taking care plan notes, and following all necessary care duties and safety protocol. Home Caregivers, also called Home Care Aides or Home Health Aides, are expected to follow a basic job description of duties, just as with all professional jobs. 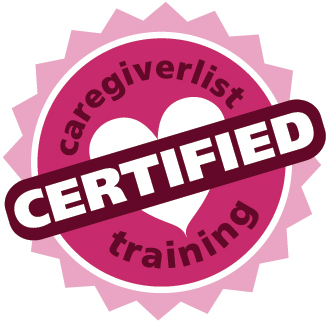 Learn proper caregiver skills for observing, reporting, and documenting daily activities, along with legal requirements and guidelines for subjective and objective notes regarding changes in the functional ability and mental status of the client. Learn how to effectively communicate with seniors from different generations, individuals with Alzheimer's Disease and other types of dementia, and those with hearing difficulties and special needs. Learn personal care tasks skills for senior clients, including bathing, skin care, hair care, nail care, mouth care, dressing, feeding, assistance with ambulation, exercise and transfers, positioning, toileting and medication reminders. Safe adaptive equipment use for assisting clients with transfers from bed to chair to toilet to showers and in and out of wheelchairs. Learn types of transfers and devices used along with requirements for each device. Learn how to maintain good hygiene for both the senior client and caregiver and safety to protect yourself and control infections. How to wash hands, use gloves properly, protect your face and body and assist seniors with good daily hygiene. Learn standards for maintaining a clean and healthy environment for your senior client and for everyone visiting and caring for them by using the proper products and following a scheduled cleaning routine based on care needs. Learn basic precautions for personal and environmental safety, including procedures to follow to protect both yourself and your senior client. Learn what emergencies require basic first aid, such as cuts and burns, and what do when they happen. Learn what events are considered natural disasters and how to create and follow an emergency preparedness plan to protect yourself and your client. Understand environmental safety precautions for homes and when working at senior care facilities. Understand confidentiality requirements for personal, financial and health information and the specifics of HIPAA, the Health Insurance Portability and Accountability Act and Who and What it is for as a caregiver. Health Insurance Portability and Accountability Act (HIPAA) of 1996 defines Covered Entities (CE's) and Business Associates (BA's). Find out more in this section. HiTECH Act was an effort to speed up the transfer to electronic health records and put in place rules on how to safeguard the information. HIPAA law and what it covers can be confusing. In this section we will give specific scenarios to help you understand what is a violation and what isn't. If you are ever in doubt about sharing information, it is always best to be more cautious. Learn the types of abuse and neglect, legal requirements for reporting (and legal punishments for not reporting) and how to protect your senior client and yourself from physical, emotional, sexual and financial abuse. Seniors experiencing a stroke often require caregiving assistance as the rehabilitate. The first 6 months following the stroke incident are the most important for performing rehabilitation activities in order to rebuild the vascular communication pathways. Alzheimer's disease progresses over time, meaning there will be days where the person has good memory and then days when they do not in the beginning of the disease. 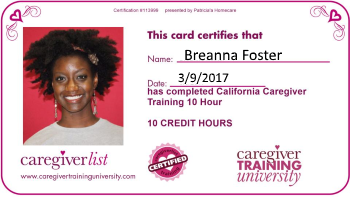 Once Course has been completed and quizzes passed (75% successful on all quizzes), a certificate of Completion is granted and maintained in the Caregiver Certification database. Participants click on the certificate link to generate and print a personalized certificate. All course quizzes must have been completed with an 75% score or above to achieve your certificate.